Christmas Ornaments Made in USA - 2009 White House Grover Cleveland Ornament - A Christmas Ornament Co.
AChristmasOrnament.com proudly presents The 2009 White House Grover Cleveland Christmas Ornament. 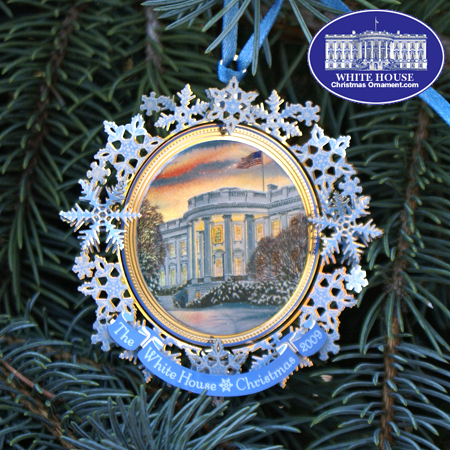 This beautiful American-made ornaments features a view of the South lawn and facade of The White House on a crispy winter evening. Inside the window, a Christmas tree with bright lights and decorations illuminates the starry night from the Oval Room. These lights pay tribute to the first Christmas tree in the White House to have electric lights. The back of the ornament shows a glance of one of many famous Christmas parties that the Cleveland family was known to throw. Grover Cleveland was the only person to serve two non-consecutive terms as President of the United States. He was the only Democrat to be elected U.S. President during the Republican political era that ran from 1860-1912. From 1928-1946 Grover Cleveland’s images appeared on the front of the $1000 Bill.